Following on from Isla Kennedy’s post earlier this month, Tricia Lowther explores the phenomenon and the effects of gender-targeted toy selling. Tricia is a blogger, activist and campaigner with Let Toys Be Toys. The major shortage of qualified STEM (science, technology, engineering and mathematics) graduates in the UK means that the lack of women in STEM careers is an issue the government seems to take seriously. There have been several media articles about girls and science recently, but little attention has been paid to the messages children take in through toys. Play is the medium through which children learn about the world and imagine the possibilities open to them. Only 13% of STEM employees are female, so why is it acceptable for science toys to be overwhelmingly marketed to boys? Not long before Christmas a survey was carried out by the Let Toys Be Toys (LTBT) campaign. Forty different UK and Ireland retail branches were visited to see how toys were being marketed. LTBT found ten times as many stores promoted tool kits to boys than to girls, construction toys were three times as likely to be promoted to boys, and twice as many stores promoted chemistry sets to boys as to girls. One of the most gendered shops in our survey was The Entertainer, which is divided into pink and blue sections labelled girls or boys toys. All the science toys, construction and warfare are in the boys section and the cleaning, prams, dolls, kitchens etc. are on the pink shelves. Marks and Spencer also did badly, with much of their packaging branded ‘Boys’ Stuff’. Campaigners photographed a ‘Boys’ Stuff’ sign over shelves that included a telescope, a human skeleton, dinosaurs and globes, all of which there is no logical reason to label ‘boys’. This image was made into a campaign poster which went viral, but has, as yet, garnered no response from M&S. Toy sellers today are sending out strongly gendered messages to an unprecedented degree. More toys are on the market than ever before and gender-targeted selling is seen as profitable, but there’s a high social cost. It’s hard to measure the extent to which toy marketing affects children, but we can be certain that it affects them. LTBT supporters have shared numerous stories of children who feel pressured not to play with the ‘wrong’ toy. Despite this, we are often told that ‘boys and girls like different toys’. Children will actually play with anything that’s presented to them as exciting, but a nature/nurture debate on gender is besides the point. There’s no need to prove anything about the nature of gender to show that limiting children’s access to play opportunities is damaging. Neuroplasticity suggests that that children’s brains develop according to the toys they play with. Construction and science toys develop spatial and problem solving skills. If girls don’t play with this type of toy then they are unlikely to be as strong as boys in this area. Recent US research found toys that are not strongly gender-typed are more likely to develop a range of skills in children. Besides the effect on brain development, there is the question of belief in gender stereotypes. Undoubtedly, children are heavily socialised by gender, and gendered toys can send some very limiting messages. Children don’t have the reasoning powers to see through the images they’re bombarded with. The UK has banned adverts for junk food to children, yet toy adverts with heavily stereotyped images continue. Car salesrooms do not have signs that say ‘Men’, kitchen departments do not have signs that say ‘Women’, so why aren’t ‘Boy’ and ‘Girl’ toy signs seen as blatant discrimination? LTBT’s critics say parents can buy toys from any shelf. That’s true, so why have gendered shelves? Every time a girl sees a shelf of science-related toys under a sign that says ‘Boys’, she is being told that the world thinks science is not for her. People are guided by signs and often only look in one section, so if buying in ‘Girls’, they are unlikely to see any science toys, unless it’s one of the recent additions to the ‘girlie toy’ canon: pink, sparkly and focused on attractiveness, like a perfume lab or make-your-own lip gloss kit. The connection between the toys children play with and the interests they later take up should be obvious. The Let Toys be Toys campaign is petitioning retailers to organise toys by theme instead of gender. Science toys aimed at boys is a small part of the picture. We want children to feel free to play with the toys they choose, instead of being told, ‘that’s for girls’ or ‘that’s a boys toy’. It can only be beneficial to see the toy market opened up to all children. If even one little girl finds herself with a science kit that she wouldn’t have otherwise had, it’s worth it. Who knows what she might one day discover? The image shows the Let Toys Be Toys campaign poster: a photo of toy globes, a robot, dinosaurs and other toys in blue boxes on the shelves of Marks and Spencer, under the sign “boys’ stuff”. 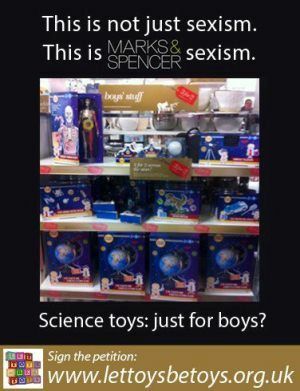 Text around the photo reads “This is not just sexism, this is Marks and Spencer sexism”, “Science toys: not just for boys” and “Sign the petition: www.lettoysbetoys.org.uk”. Well said! As a parent and owner of an online toy store (www.turnertoys.com), I feel that it’s really important that we introduce science toys and kits to both boys and girls from an early age. Not only is science fun for kids but playing with science toys can be a confidence-builder, too. I’ve reposted your blog in our forthcoming blog on flying toys for beginners. Cheers!